SR66 DORSEY-COLOMB TRANSPORTATION/DEV DEPT - Requests DOTD to perform a study relative to the increase in the noise decibel levels as a result of the expansion of LA 42 (Burbank Drive) and elsewhere in Baton Rouge. SR105 THOMPSON TRANSPORTATION/DEV DEPT - Requests the Department of Transportation and Development to study solutions to the buildup of sediment around Louisiana ports and to consult with the Department of Agriculture and Forestry. 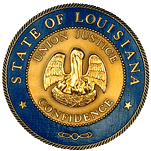 SCR77 ALLAIN ROADS/HIGHWAYS - Requests DOTD and DOAF to identify and mark farm to market highways in Louisiana. SCR93 TROY BROWN TRANSPORTATION/DEV DEPT - Requests DOTD to take action to provide greater safety to the motoring public, to move traffic more efficiently, and to minimize traffic accidents at the intersection of Cornerview Road and LA 73 and on LA 22 between I-10 and LA 70 in Ascension Parish. HB402 BARRAS HIGHWAYS - Designates an overpass on U. S. Highway 90 in Iberia Parish as the "George Rodrigue Memorial Overpass"
HB762 ORTEGO HIGHWAYS - Amends the spelling of the "Hadley J. Castille-Pecanaire Highway"